The given chart concentrates on information about science certifications gained by people who live in Malaysia and Singapore. Overall, what stand out of the chart is that the highest rate in the both countries come from no qualification in science. By contrary, the lowest percentage of science certification in Singapore and Malaysia is master’s degree. 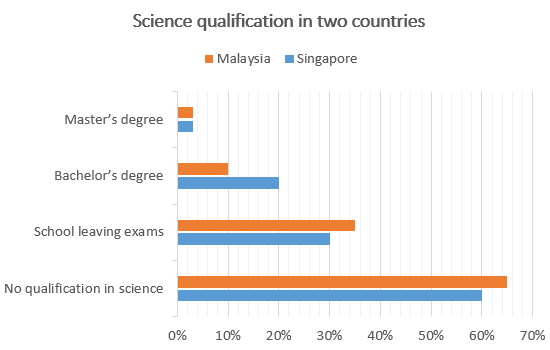 As is illustrated, in term of the proportion of no qualification in science, Malaysia makes up with 65% while Singapore have 60 per cent in this sector. Similarly, the rate of science qualification in School leaving examination field has 36% and 30% for Malaysia and Singapore, respectively. As regarded, the percentage of bachelor’s degree, which people live in Malaysia received just 10% while in Singapore, it is significant higher two times with 20%. When come to the lowest proportion in 4 sectors is master’s degree, Malaysia and Singapore have equal rate just below 5% for each nation. Overall, what standstands out of the chart is that the highest rate in the both countries comecomes from no qualification in science. By contrary, the lowest percentage of science certification in Singapore and Malaysia is master’sthe master's degree. As is illustrated, in termterms of the proportion of no qualification in science, Malaysia makes up with 65% while Singapore havehas 60 per cent in this sector. Similarly, the rate of science qualification in the School -leaving examination field has 36% and 30% for Malaysia and Singapore, respectively. As regarded, the percentage of bachelor’s degree, which people live in Malaysia received just 10% while in Singapore, it is significantsignificantly higher two times with 20%. When come to the lowest proportion in 4 sectors is the master’s degree, Malaysia and Singapore have equal rate just below 5% for each nation. The table below gives information about the participation of 11-14 year-olds by gender in extreme sports in the UK in 2003. Summarise the information by selecting and reporting the main features, and make comparisons where relevant.